In this issue of the JCI, Vuckovic et al. reveal that myeloma-experienced T cells facilitate myeloma control following bone marrow transfer. Graft-derived cytokines also influenced posttransplant myeloma progression and control. These insights into the cellular and molecular immune mediators of autologous SCT’s effects provide avenues to improve therapeutic outcomes in multiple myeloma. 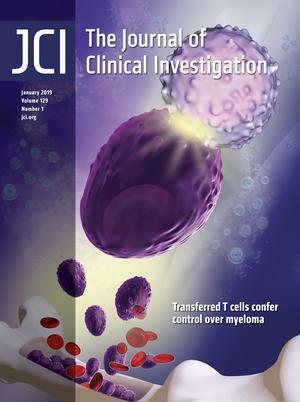 The cover image illustrates the interaction of T cells with myeloma in the bone marrow environment. Image credit: Madeleine Kersting Flynn, QIMR Berghofer. Citation Information: J Clin Invest. 2019;129(1):46-47. https://doi.org/10.1172/JCI126046. Citation Information: J Clin Invest. 2019;129(1):48-50. https://doi.org/10.1172/JCI125431. Citation Information: J Clin Invest. 2019;129(1):51-52. https://doi.org/10.1172/JCI124583. Blocking HIV-1 replication: are Fc–Fcγ receptor interactions required? Citation Information: J Clin Invest. 2019;129(1):53-54. https://doi.org/10.1172/JCI125264. Interactions between IgG Fc and its receptors (FcγRs) have been shown to augment broadly neutralizing Ab–mediated (BnAb-mediated) protection from simian-human immunodeficiency virus (SHIV) challenge. In the current issue of the JCI, Parsons and collaborators compared the BnAb PGT121 with a version engineered to have impaired FcγR binding for their ability to protect macaques from an intravenous challenge with SHIV-infected cells as well as to treat already infected animals. Unexpectedly, and in contrast to previous studies, both versions of the Ab were equally able to prevent infection and decrease viral loads in infected animals. Thus, FcγR engagement does not always improve the in vivo antiviral activity of BnAbs. Citation Information: J Clin Invest. 2019;129(1):55-57. https://doi.org/10.1172/JCI125203. Citation Information: J Clin Invest. 2019;129(1):58-59. https://doi.org/10.1172/JCI125318. Citation Information: J Clin Invest. 2019;129(1):60-62. https://doi.org/10.1172/JCI125432. Citation Information: J Clin Invest. 2019;129(1):63-65. https://doi.org/10.1172/JCI125433. Citation Information: J Clin Invest. 2019;129(1):66-68. https://doi.org/10.1172/JCI125378. Hereditary angioedema (HAE) is a rare genetic disorder primarily caused by mutations in the SERPING1 gene encoding the C1 inhibitor (C1INH) that leads to plasma deficiency, resulting in recurrent attacks of severe swelling. In the current issue of the JCI, Haslund et al. show that in a subset of patients with type I HAE, mutated C1INH encoded by HAE-causing SERPING1 acts upon wildtype (WT) C1INH in a dominant-negative manner and forms intracellular C1INH aggregates. These aggregates lead to a reduction in the levels of secreted functional C1INH, thereby manifesting in the condition that allows the disease state. Interestingly, administration of WT SERPING1 gene is able to restore the levels of secreted C1INH, thereby opening up a novel mechanism justifying gene therapy for HAE. Citation Information: J Clin Invest. 2019;129(1):69-71. https://doi.org/10.1172/JCI125471. Adoptive cell transfer (ACT) of engineered T cell receptors (TCRs) for cancer immunotherapy has evolved from simple gene transfer of isolated TCRs to various affinity enhancement techniques that overcome limitations imposed by central and peripheral tolerance on TCR affinity. In the current issue of the JCI, Poncette et al. used mice with human TCRαβ and HLA gene loci to discover CD4+ TCRs of optimal affinity for cancer testis antigen (CTA) NY-ESO-1. They combined this TCR with a previously discovered NY-ESO-1–specific CD8+ TCR in an ACT fibrosarcoma tumor model to demonstrate the importance of T cell help in mediating antitumor responses. Citation Information: J Clin Invest. 2019;129(1):72-74. https://doi.org/10.1172/JCI125509. Citation Information: J Clin Invest. 2019;129(1):75-77. https://doi.org/10.1172/JCI125800. Antibodies that target immune checkpoint molecules, such as CTLA4, provide robust antitumor effects in a subset of patients. Unfortunately, not all patients respond to immune checkpoint inhibition, and some develop life-threatening immune-related adverse events (irAEs). The mechanisms that underlie irAEs from immune checkpoint inhibition are not fully understood, and treatment strategies are currently limited to targeting inflammatory mediators. In this issue of the JCI, Pai et al. report on their development of a modified CTLA4 antibody that shields the inner CTLA4-binding domain until the antibody is within the protease-rich tumor microenvironment. In a lymphopenic murine model reconstituted with naive CD4+ T cells, adapted anti-CTLA4 reduced the occurrence of irAEs and enhanced antitumor effects. This thought-provoking study lays the groundwork for further exploration of this adapted antibody in immunocompetent hosts and introduction of this adaptation to other immune checkpoint molecules. It also suggests that this approach may reduce the incidence of irAEs. Citation Information: J Clin Invest. 2019;129(1):93-105. https://doi.org/10.1172/JCI121341. Vaccines are among the most effective public health tools for combating certain infectious diseases such as influenza. The role of the humoral immune system in vaccine-induced protection is widely appreciated; however, our understanding of how antibody specificities relate to B cell function remains limited due to the complexity of polyclonal antibody responses. To address this, we developed the Spec-seq framework, which allows for simultaneous monoclonal antibody (mAb) characterization and transcriptional profiling from the same single cell. Here, we present the first application of the Spec-seq framework, which we applied to human plasmablasts after influenza vaccination in order to characterize transcriptional differences governed by B cell receptor (BCR) isotype and vaccine reactivity. Our analysis did not find evidence of long-term transcriptional specialization between plasmablasts of different isotypes. However, we did find enhanced transcriptional similarity between clonally related B cells, as well as distinct transcriptional signatures ascribed by BCR vaccine recognition. These data suggest IgG and IgA vaccine–positive plasmablasts are largely similar, whereas IgA vaccine–negative cells appear to be transcriptionally distinct from conventional, terminally differentiated, antigen-induced peripheral blood plasmablasts. Citation Information: J Clin Invest. 2019;129(1):137-149. https://doi.org/10.1172/JCI121266. Glioblastoma is highly enriched with macrophages, and osteopontin (OPN) expression levels correlate with glioma grade and the degree of macrophage infiltration; thus, we studied whether OPN plays a crucial role in immune modulation. Quantitative PCR, immunoblotting, and ELISA were used to determine OPN expression. Knockdown of OPN was achieved using complementary siRNA, shRNA, and CRISPR/Cas9 techniques, followed by a series of in vitro functional migration and immunological assays. OPN gene–deficient mice were used to examine the roles of non-tumor-derived OPN on survival of mice harboring intracranial gliomas. Patients with mesenchymal glioblastoma multiforme (GBM) show high OPN expression, a negative survival prognosticator. OPN is a potent chemokine for macrophages, and its blockade significantly impaired the ability of glioma cells to recruit macrophages. Integrin αvβ5 (ITGαvβ5) is highly expressed on glioblastoma-infiltrating macrophages and constitutes a major OPN receptor. OPN maintains the M2 macrophage gene signature and phenotype. Both tumor-derived and host-derived OPN were critical for glioma development. OPN deficiency in either innate immune or glioma cells resulted in a marked reduction in M2 macrophages and elevated T cell effector activity infiltrating the glioma. Furthermore, OPN deficiency in the glioma cells sensitized them to direct CD8+ T cell cytotoxicity. Systemic administration in mice of 4-1BB–OPN bispecific aptamers was efficacious, increasing median survival time by 68% (P < 0.05). OPN is thus an important chemokine for recruiting macrophages to glioblastoma, mediates crosstalk between tumor cells and the innate immune system, and has the potential to be exploited as a therapeutic target. Citation Information: J Clin Invest. 2019;129(1):169-181. https://doi.org/10.1172/JCI121087. BACKGROUND. Chronic obstructive pulmonary disease (COPD) is a heterogeneous smoking-related disease characterized by airway obstruction and inflammation. This inflammation may persist even after smoking cessation and responds variably to corticosteroids. Personalizing treatment to biologically similar “molecular phenotypes” may improve therapeutic efficacy in COPD. IL-17A is involved in neutrophilic inflammation and corticosteroid resistance, and thus may be particularly important in a COPD molecular phenotype. METHODS. We generated a gene expression signature of IL-17A response in bronchial airway epithelial brushings from smokers with and without COPD (n = 238), and validated it using data from 2 randomized trials of IL-17 blockade in psoriasis. This IL-17 signature was related to clinical and pathologic characteristics in 2 additional human studies of COPD: (a) SPIROMICS (n = 47), which included former and current smokers with COPD, and (b) GLUCOLD (n = 79), in which COPD participants were randomized to placebo or corticosteroids. RESULTS. The IL-17 signature was associated with an inflammatory profile characteristic of an IL-17 response, including increased airway neutrophils and macrophages. In SPIROMICS the signature was associated with increased airway obstruction and functional small airways disease on quantitative chest CT. In GLUCOLD the signature was associated with decreased response to corticosteroids, irrespective of airway eosinophilic or type 2 inflammation. CONCLUSION. These data suggest that a gene signature of IL-17 airway epithelial response distinguishes a biologically, radiographically, and clinically distinct COPD subgroup that may benefit from personalized therapy. TRIAL REGISTRATION. ClinicalTrials.gov NCT01969344. FUNDING. Primary support from the NIH, grants K23HL123778, K12HL11999, U19AI077439, DK072517, U01HL137880, K24HL137013 and R01HL121774 and contracts HHSN268200900013C, HHSN268200900014C, HHSN268200900015C, HHSN268200900016C, HHSN268200900017C, HHSN268200900018C, HHSN268200900019C and HHSN268200900020C. Citation Information: J Clin Invest. 2019;129(1):192-208. https://doi.org/10.1172/JCI122819. BACKGROUND. Liquid biopsies have demonstrated that the constitutively active androgen receptor splice variant-7 (AR-V7) associates with reduced response and overall survival from endocrine therapies in castration-resistant prostate cancer (CRPC). However, these studies provide little information pertaining to AR-V7 expression in prostate cancer (PC) tissue. METHODS. Following generation and validation of a potentially novel AR-V7 antibody for IHC, AR-V7 protein expression was determined for 358 primary prostate samples and 293 metastatic biopsies. Associations with disease progression, full-length androgen receptor (AR-FL) expression, response to therapy, and gene expression were determined. RESULTS. We demonstrated that AR-V7 protein is rarely expressed (<1%) in primary PC but is frequently detected (75% of cases) following androgen deprivation therapy, with further significant (P = 0.020) increase in expression following abiraterone acetate or enzalutamide therapy. In CRPC, AR-V7 expression is predominantly (94% of cases) nuclear and correlates with AR-FL expression (P ≤ 0.001) and AR copy number (P = 0.026). However, dissociation of expression was observed, suggesting that mRNA splicing remains crucial for AR-V7 generation. AR-V7 expression was heterogeneous between different metastases from a patient, although AR-V7 expression was similar within a metastasis. Moreover, AR-V7 expression correlated with a unique 59-gene signature in CRPC, including HOXB13, a critical coregulator of AR-V7 function. Finally, AR-V7–negative disease associated with better prostate-specific antigen (PSA) responses (100% vs. 54%, P = 0.03) and overall survival (74.3 vs. 25.2 months, hazard ratio 0.23 [0.07–0.79], P = 0.02) from endocrine therapies (pre-chemotherapy). CONCLUSION. This study provides impetus to develop therapies that abrogate AR-V7 signaling to improve our understanding of AR-V7 biology and to confirm the clinical significance of AR-V7. FUNDING. Work at the University of Washington and in the Plymate and Nelson laboratories is supported by the Department of Defense Prostate Cancer Research Program (W81XWH-14-2-0183, W81XWH-12-PCRP-TIA, W81XWH-15-1-0430, and W81XWH-13-2-0070), the Pacific Northwest Prostate Cancer SPORE (P50CA97186), the Institute for Prostate Cancer Research, the Veterans Affairs Research Program, the NIH/National Cancer Institute (P01CA163227), and the Prostate Cancer Foundation. Work in the de Bono laboratory was supported by funding from the Movember Foundation/Prostate Cancer UK (CEO13-2-002), the US Department of Defense (W81XWH-13-2-0093), the Prostate Cancer Foundation (20131017 and 20131017-1), Stand Up To Cancer (SU2C-AACR-DT0712), Cancer Research UK (CRM108X-A25144), and the UK Department of Health through an Experimental Cancer Medicine Centre grant (ECMC-CRM064X). Citation Information: J Clin Invest. 2019;129(1):209-214. https://doi.org/10.1172/JCI99170. Citation Information: J Clin Invest. 2019;129(1):252-267. https://doi.org/10.1172/JCI122064. Citation Information: J Clin Invest. 2019;129(1):324-335. https://doi.org/10.1172/JCI120391. Adoptive transfer of T cell receptor–engineered (TCR-engineered) T cells is a promising approach in cancer therapy but needs improvement for more effective treatment of solid tumors. While most clinical approaches have focused on CD8+ T cells, the importance of CD4+ T cells in mediating tumor regression has become apparent. Regarding shared (self) tumor antigens, it is unclear whether the human CD4+ T cell repertoire has been shaped by tolerance mechanisms and lacks highly functional TCRs suitable for therapy. Here, TCRs against the tumor-associated antigen NY-ESO-1 were isolated either from human CD4+ T cells or from mice that express a diverse human TCR repertoire with HLA-DRA/DRB1*0401 restriction and are NY-ESO-1 negative. NY-ESO-1–reactive TCRs from the mice showed superior recognition of tumor cells and higher functional activity compared with TCRs from humans. We identified a candidate TCR, TCR-3598_2, which was expressed in CD4+ T cells and caused tumor regression in combination with NY-ESO-1–redirected CD8+ T cells in a mouse model of adoptive T cell therapy. These data suggest that MHC II–restricted TCRs against NY-ESO-1 from a nontolerant nonhuman host are of optimal affinity and that the combined use of MHC I– and II–restricted TCRs against NY-ESO-1 can make adoptive T cell therapy more effective. Citation Information: J Clin Invest. 2019;129(1):336-348. https://doi.org/10.1172/JCI122359. Citation Information: J Clin Invest. 2019;129(1):349-363. https://doi.org/10.1172/JCI123391. While immune checkpoint blockade leads to potent antitumor efficacy, it also leads to immune-related adverse events in cancer patients. These toxicities stem from systemic immune activation resulting in inflammation of multiple organs, including the gastrointestinal tract, lung, and endocrine organs. We developed a dual variable domain immunoglobulin of anti-CTLA4 antibody (anti-CTLA4 DVD, where CTLA4 is defined as cytotoxic T lymphocyte–associated antigen-4) possessing an outer tumor-specific antigen-binding site engineered to shield the inner anti-CTLA4–binding domain. Upon reaching the tumor, the outer domain was cleaved by membrane type-serine protease 1 (MT-SP1) present in the tumor microenvironment, leading to enhanced localization of CTLA4 blockade. Anti-CTLA4 DVD markedly reduced multiorgan immune toxicity by preserving tissue-resident Tregs in Rag 1–/– mice that received naive donor CD4+ T cells from WT C57BL/6j mice. Moreover, anti-CTLA4 DVD induced potent antitumor effects by decreasing tumor-infiltrating Tregs and increasing the infiltration of antigen-specific CD8+ T lymphocytes in TRAMP-C2–bearing C57BL/6j mice. Treg depletion was mediated through the antibody-dependent cellular cytotoxicity (ADCC) mechanism, as anti-CTLA4 without the FcγR-binding portion (anti-CTLA4 DANA) spared Tregs, preventing treatment-induced toxicities. In summary, our results demonstrate an approach to anti-CTLA4 blockade that depletes tumor-infiltrating, but not tissue-resident, Tregs, preserving antitumor effects while minimizing toxicity. Thus, our tumor-conditional anti-CTLA4 DVD provides an avenue for uncoupling antitumor efficacy from immunotherapy-induced toxicities. Citation Information: J Clin Invest. 2019;129(1):388-405. https://doi.org/10.1172/JCI98869. Hereditary angioedema (HAE) is an autosomal dominant disease characterized by recurrent edema attacks associated with morbidity and mortality. HAE results from variations in the SERPING1 gene that encodes the C1 inhibitor (C1INH), a serine protease inhibitor (serpin). Reduced plasma levels of C1INH lead to enhanced activation of the contact system, triggering high levels of bradykinin and increased vascular permeability, but the cellular mechanisms leading to low C1INH levels (20%–30% of normal) in heterozygous HAE type I patients remain obscure. Here, we showed that C1INH encoded by a subset of HAE-causing SERPING1 alleles affected secretion of normal C1INH protein in a dominant-negative fashion by triggering formation of protein-protein interactions between normal and mutant C1INH, leading to the creation of larger intracellular C1INH aggregates that were trapped in the endoplasmic reticulum (ER). Notably, intracellular aggregation of C1INH and ER abnormality were observed in fibroblasts from a heterozygous carrier of a dominant-negative SERPING1 gene variant, but the condition was ameliorated by viral delivery of the SERPING1 gene. Collectively, our data link abnormal accumulation of serpins, a hallmark of serpinopathies, with dominant-negative disease mechanisms affecting C1INH plasma levels in HAE type I patients, and may pave the way for new treatments of HAE. Citation Information: J Clin Invest. 2019;129(1):437-437. https://doi.org/10.1172/JCI126191.